First of all, I need to highlight that I was a personal friend of the late Vince Flynn, and assisted him as he developed the characters of the Mitch Rapp series. Thus, I do have some personal bias when reviewing the books in the series, as authored by Kyle Mills. 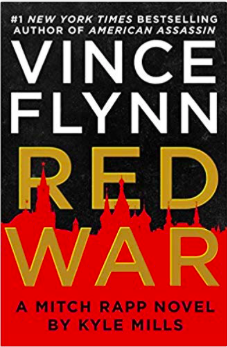 Red War’s thrust centers on the deteriorating health of the Russian President, as he wrestles and seeks alternative medical treatment for inoperable brain cancer. The Russian President, Maxim Krupin, is worried that his political opponents will seize on any perceived illness or weakness and move against him. Because of that concern, Krupin reactivates a retired Russian general who has been in isolation for some time but has remained unwaveringly loyal to Krupin. The Russian General is a nationalist of old school Soviet military think.